Look, we’ll be honest: It’s been a long time since the Rio Olympics, and a lot of stuff has happened, so it hasn’t really been on our minds. Something crazy definitely happened with Ryan Lochte at the Olympics. He went to jail, or, like, blew up a gas station? And then there was something about how he came back to the United States, but the Brazilian government made him go back to Brazil to stand trial for something. If we remember correctly, he claimed that the army tried to kill him. Or it was something like, Ryan Lochte told The New York Times that the president of Brazil tried to strangle him with a necklace. It is obviously illegal to frame the army for murder in Brazil, so, to the best of our recollection, Ryan Lochte went to jail and may still be there? He might have been executed. The Rio Olympics marked the bittersweet end to the incredible career of swimming legend Michael Phelps, who, if we can remember all the way back to August, said that he was leaving Olympic swimming behind so that he could have more free time to lather up his wife and children in sunscreen to make sure they didn’t get red and horrible in the sun. He definitely said he was retiring because of some family thing, and the first thing that’s coming to us here is that it was specifically that he needed to follow his whole family around and basically drown them in white, healthy sunscreen at all times. Congratulations on an incredible career, Michael, and good luck protecting your family from UV rays if our memory serves! To the best of our knowledge, the Rio Olympics had plenty of controversy both on and off the field, but the one thing we kind of remember being one of the most scandalous moments of the entire event was when sprinting legend Usain Bolt landed himself in hot water for accusing talk-show sweetheart Ellen DeGeneres of murder. It was something along the lines of Usain Bolt won his race and then ran up to the camera and held up a photoshop of Ellen DeGeneres stuffing a police officer into the garbage disposal in her sink, and people got really mad. We’d need to look this up, but we’re about 60 percent sure somebody said that Usain Bolt trying to frame Ellen DeGeneres for murder made both Usain Bolt and Ellen DeGeneres anti-Semitic. This was more likely than not one of the biggest bombshell moments of the whole Olympics! One of the most “Did you see that? !” moments of the 2016 Olympics was definitely some sort of thing involving the balance beam. 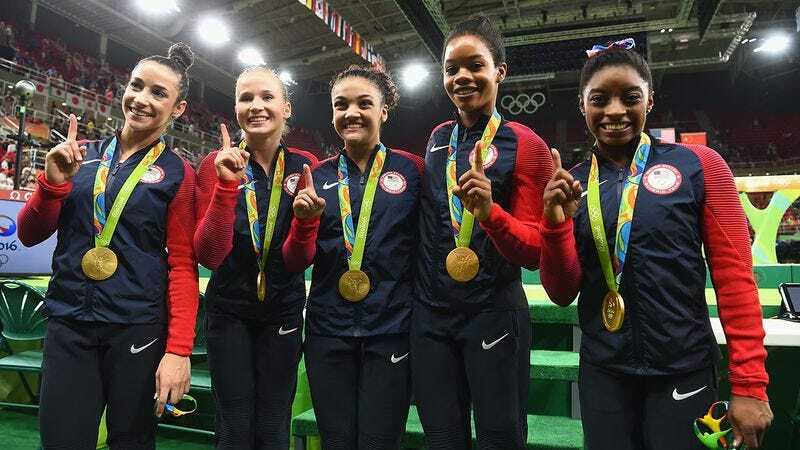 It was something like the U.S. women’s gymnastics team climbed onto the balance beam together to set the record for the longest time spent on a balance beam, or Russia was disqualified from the Olympics because their balance beam was too long or they used it to knock down a hornet’s nest and so everyone from Russia had to leave the Olympics. Whatever it was, it was definitely something about balance beams, and it will go down as one of the greatest moments in the history of the Olympics. 5. Simone Biles invented a new type of cartwheel where you hold a sword, and a girl from Romania died trying to do it. Simone Biles was DEFINITELY part of the 2016 Olympics. Someone called her the best gymnast ever, or possibly the youngest gymnast ever. It was a thing along those lines. Anyway, Biles, we seem to recall, won the gold medal by inventing the “Biles cartwheel,” which was an extra-dangerous kind of cartwheel where you do a cartwheel while holding a sword. Does this sound familiar to anyone else? And then there was an article in maybe the Washington Post about how a gymnast from Romania tried to do the Biles cartwheel, but the sword she was holding killed her. We vaguely remember this being one of the most emotional moments of the Rio Olympics!